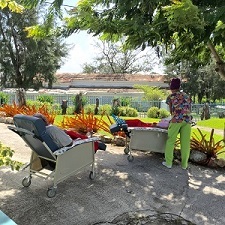 Hospice care in Antigua initially started with palliative care being offered in homes when it was discovered that there were no available options for persons diagnosed with terminal illness. In response to this need, a Palliative Home Care Service came into being under the auspices of the St. John Ambulance Association in 2007. However, it became very clear that a residential facility was necessary that offered round the clock care, and after much searching, a permanent home was found for St John Hospice in the old Gwenneth O’Reilly Building at Holberton Hospital. The St John Hospice opened the doors to this facility on December 2nd, 2011. The bright and cheery atmosphere of St John Hospice, along with our amazing medical team of Nurse Aides, RN’s and Doctors, continues to enable us to provide a pleasant place for our patients. 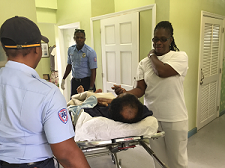 Because of this, word has spread and Hospice is now an accepted health care facility in the community. The Patron of the hospice is His Excellency Sir Rodney Williams, and the hospice is run by a Board comprising: Heather Mannix Labadie (Chairperson), Angie Bascus (Treasurer), Sharon Cort-Thibou (Legal Council), Agnes Meeker (Founder), Cathlyn Gilkes (Administrator), Dr. Raphael Evanson, Patrick Ryan, Charlene Selkridge, Rosemary Magoris and Gladstone Joseph, members. Friends of Hospice is the fundraising arm of hospice and its members include: Heather Mannix-Labadie, Fay Griffith, Phillip Harris, Nicola Mykoo, Gary Fletcher, Charlene Selkridge, Juanita Nanton, Vernie Lake, Pauline Perry and Gladstone Joseph. Our staff members include: Cathlyn Gilkes (Administrator), Eutha Meade (Office Assistant), Matthias Telemaque (Driver/Handyman), Dr. Tadia Smith, RN’s Inez Stevens, Cassandra Jones & Allisongaye Henry, Nurse Aides Jacquelyn Nathaniel, Kathleen James, Gracelyn Ricketts, Christine Simon, Cellina Paige, Joanne Morgan, Ivorino Shadrach & Georgina Titre-Phillip and Housekeeper, Marlene Hope Whitmore. Our dedicated volunteers are Agnes Meeker (Founder), Dr. Raphael Evanson (Medical Doctor), Gary Fletcher (Handyman), Norma Fabien (Massage Therapist), Anette Holt (window cleaner). A dedicated group of volunteers led by Rosemary Magoris run our thrift shop Fashion Encore I on Bishopgate Street and Carolyn Barretto with her team operate the newly opened Fashion Encore II, located on the premises of the hospice. Hospice gives people who are terminally ill the opportunity to die with dignity and compassion in a tranquil environment, cared for by professionally trained staff. Donations may be dropped off anytime at the hospice. Donate new or “gently used” clothing or household items to our thrift shops. In lieu of birthday or anniversary gifts, ask guests to contribute canned goods or monetary gift to hospice. In lieu of flowers ask family and friends to donate to Hospice in memory of a loved one. Donate home grown items from your garden when abundant – we need only a few at a time. Consider a monthly donation to St John Hospice. Donate the loyalty points that you accumulate at 1st Choice or Epicurean to St John Hospice.